Chantel Osahor averages an NCAA-best 14.8 rebounds per game, and has an NCAA-leading 20 double-doubles on the year. Associated Press archive photo. 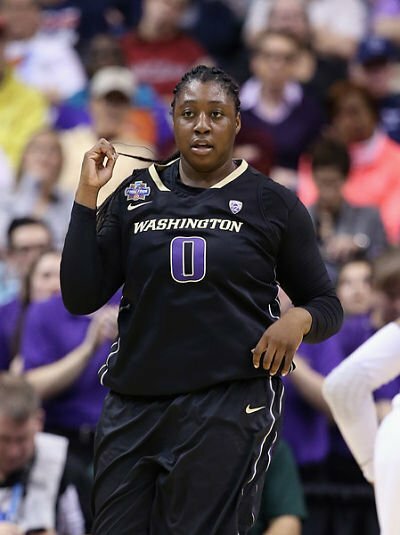 Even for someone who routinely fills up a stats sheet, Washington senior center Chantel Osahor performed exceptionally well Jan. 30-Feb. 5, which is why she is WomensHoopsWorld’s player of the week. 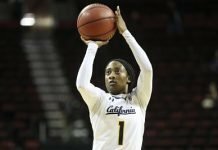 Osahor, who has lead NCAA Division I in rebounds all season long, had a double-double by halftime of Friday’s win over Utah, and finished with 19 points and 20 rebounds. She followed that up in Sunday’s outing against Colorado with 20 points and 16 rebounds off of 6-10 field goal shooting. It was her 20th double-double of the season – tops in the NCAA. 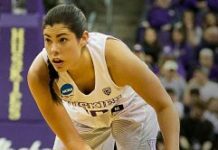 The Arizona native won a lot of attention during the Husky’s 2016 run to the Final Four for her flat-footed shooting style, but the most noteworthy aspect of her game is her strength. Osahor out-muscles opponents in the paint to completely dominate, in most cases. She averages 14.8 rebounds on the year, but broke the Pac 12 single-game rebounding record Jan. 22 with 30. She is double- and triple-teamed every game, but still manages to be effective. The Huskies are currently in third place in conferences standings with a 10-2 record. This weekend they host the Arizona schools.